﻿﻿﻿We are here to help you on your learning adventure, so we have created a new song pattern for you to try! 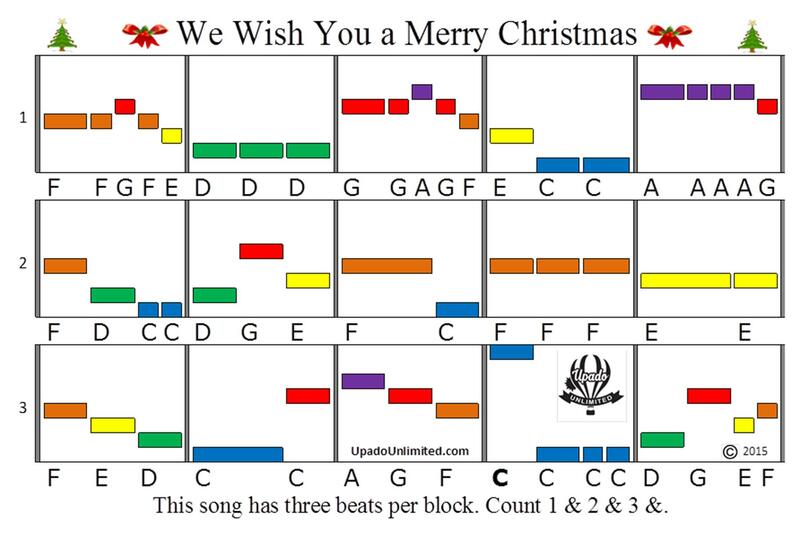 ​Many of our song patterns have harmony pieces, too. If you have two instruments or are leading a school, choir, homeschool or community group, please contact us for more information. More Music Song Patterns are available in our newest book Popular 8 Note Songs with FREE Audio online! We hope you enjoy the song below and have a wonderful holiday season! Part of the fun of music is playing together with other people. In your Xylophone Music Book, you will find three songs that can be played either as duets or as a trio. Listen for the notes running down the scale in the middle of the recording. All three xylophones are playing together perfectly in tune! The Bach Minuet is the most challenging piece in your Xylophone Music Book. Listening to a song before you play it can help you learn it more quickly. In this recording, two violins are playing in the background. Copyright Note: All Upado Unlimited Song Patterns are copyrighted, and you are granted permission to only download, print and store the Music Song Pattern above for your personal, non-commercial use one time only in conjunction with your purchase of an Upado Unlimited product. Thank you so much for your understanding and cooperation!